Everyone heard of the “German Potato Salad”. However you will find hundreds of variations of this popular dish. 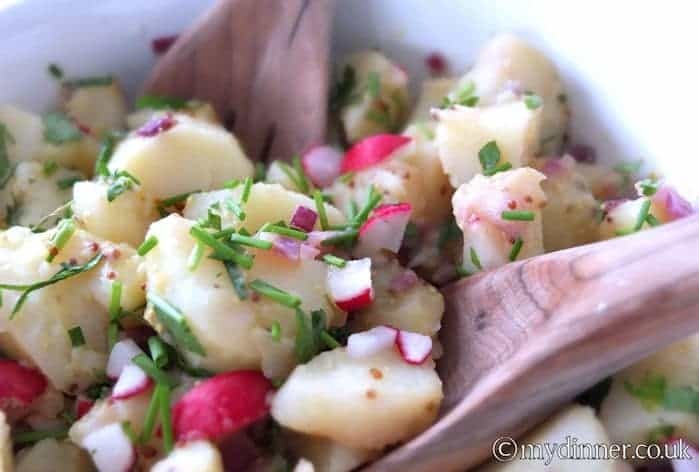 Almost every German family has a potato salad recipe of their own. In my attempt to create a German Food blog I feel like I have to share my version of it. This is my “save” dish that I bring along to any pot luck and BBQ because you will always find someone who loves it. Plus it’s budget friendly and really easy to prepare. Also it is a lot healthier than the potato salads that I am used to in England because it does not have mayonnaise in it. In Germany my mum would serve it as a side to various other dishes. Commonly you serve it with sausages (frankfurters or bratwurst), meatballs or schnitzel. Some families eat it warm but we usually have it chilled. I prepared this meal as a light lunch for me and my husband with Bavarian white sausages and sweet mustard. Peal potatoes, and boil for 20 minutes or until soft. In the meantime, mix the vinegar, oil, mustards to a smooth paste. Once the potatoes are boiled, drain them and place into a bowl. Mix in the vinegrette paste and onions. Leave to stand for about an hour or so. You will see the potatoes absorb the liquid.